Made of woven glass fabric, impregnated and coated with food grade silicone. Silform sub is pre-formed and gives total flexibility. Provides the best possible use of trays and racks in the bakery. 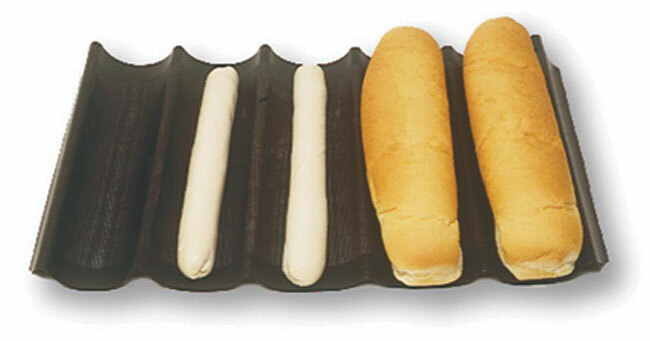 This nonstick bread form is ideal to bake your hoagies for sub sandwiches. Reusable between 2000 and 3000 times. Heat resistant from -40º to +580ºF. No greasing is necessary. Clean with a sponge. Channel Name - Sub Roll. Number of Channels - 5. Number of Channels - 4. Number of Channels - 7. Number of Channels - 6. Number of Channels - 8.